OPPO-a leading global smartphone brand-has officially arrived in Saudi Arabia, bringing to the Kingdom products that seamlessly combine breakthrough technology with artistic design. The launch coincides with the release of its hero smartphone series, the OPPO R Series, and the availability of its two latest R Series smartphones the OPPO R17 and the OPPO R17 Pro. OPPO announced its expansion to Saudi Arabia during a high-profile launch event held in Riyadh-where OPPO will maintain its KSA headquarters-with OPPO executives showcasing the company's technology vision and sharing their commitment to innovating with partners in the Kingdom. Far from an ordinary launch, the immersive show was held under the concept of 'Seize the Night' and included a combination of interactive fashion and technology exhibitions. OPPO entered the global smartphone market in 2011 and has since become one of the world's most popular smartphone brands-particularly among young people-with over 200 million consumers around the world using OPPO smartphones. In less than a decade, the company has pioneered several industry firsts in mobile photography and technology. In the last year, OPPO has undertaken an aggressive expansion plan that has included venturing into the GCC and expanding into Western Europe. The geographic expansion has been coupled with an increase in global R&D spending, set at around USD$1.43 billion for 2019 alone and a 150% year-on-year increase. OPPO is also setting benchmarks for emerging technologies like 5G mobile broadband, and has taken early steps to trial 5G technologies in its devices. Since last year, OPPO started to adjust its product line in the region by offering mid to high-end products. Just this month the company also opened a new hub for the Middle East and Africa to oversee OPPO's continued expansion. Andy Shi, President of OPPO Middle East and Africa, said: "At OPPO, we believe the most important thing is to give consumers access to premium technology. We have done this successfully over the last decade by being a company that values exploration, celebrates the beauty of technology, and dares to innovate in everything we do." "Our journey has now brought us to Saudi Arabia, and we are incredibly excited by the opportunities in the Kingdom. It is a country with a thriving young population, a diversifying economy, and one in which consumers have clearly embraced creative technologies. We are confident that OPPO will bring a new dynamic to the Kingdom's consumer electronics space," added Shi. Consumers in Saudi Arabia will be able to purchase OPPO smartphones very soon through a variety of online and offline channels. FMP is OPPO's national distributor through which OPPO products will be widely distributed across the kingdom. OPPO and FMP will cooperate to help both the brand and products move forward in the Kingdom. In the future, OPPO will keep extending its business through the Kingdom with the possible support of additional partners, both online and offline. The first OPPO smartphones to arrive in Saudi Arabia are the company's OPPO R17 and OPPO R17 Pro. The R Series is one of the world's most popular smartphone lineups offering premium features at value. According to research firms Counterpoint and Strategy Analytics, the OPPO R9 was one of 2016's best-selling smartphones globally, and in 2017 the OPPO R11 became the bestselling Android phone of the year. Infused with art and innovative technology, the OPPO R17 and OPPO R17 Pro adopt a revolutionary gradient design while bringing unique functions to night photography, super-fast charging, and more. Night shooting is one of the most difficult challenges in the smartphone industry, but the OPPO R17 Pro greatly upgrades both hardware and software. The Ultra-Night Mode brings together long exposure stabilization, noise cancellation, and a wider dynamic range to have the most clear and detailed night shot. The smartphone's AI Ultra-clear Engine is another unique image-enhancing tool that results in pixel-level color restoration that shows your favorite scenes the way they actually look. Its triple rear-camera setup further allows for RAW HDR photography and AI scene recognition. The new AI Beauty Camera is powered by a 25MP front camera that makes it easy to define yourself on your own terms. Featuring face slimming, makeup, and six other fully-configurable modes as well as a live preview option, the AI Beauty Camera lets you decide what goes into the making of a perfect shot. The OPPO R17's AI-enhanced dual rear camera also lets you create stunning portrait photographs through natural layering. With its highly-awarded VOOC flash charge, the OPPO R17's large 3500mAh battery can reach a full charge quickly and safely thanks to five-core protection that lets you use the phone freely while charging. Just five minutes of charge provides an estimated two hours of talking time. The OPPO R17 Pro also carries SuperVOOC flash charging technology, using almost 2.5 times the charging power of a regular VOOC adaptor. For the OPPO R17 Pro, it only takes 10 minutes to charge a flat battery to 40% and 35 minutes to get fully charged. As the pathfinder of smartphone gradient design, OPPO has invented a new three-color and quad-direction gradient design for the OPPO R17. Through adding a light-condensing layer, the R17 series allows light to flow on the surface of the device, demonstrating a fresh, original color aesthetic. Fingerprint-resistant and durable, it's designed to enchant your eye while pleasing your sense of touch. The OPPO R17 series also adopts Corning® Gorilla® Glass 6 for the first time, with a 91.5% screen-to-body ratio and Hidden Fingerprint Unlock. 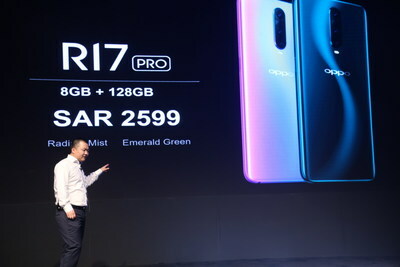 The OPPO R17 comes into Saudi Arabia with two colors - Ambient Blue and Nero Purple-and the OPPO R17 Pro comes in Emerald Green and Radiant Mist. The OPPO R17 comes with 6GB RAM and 128GB ROM while the R17 Pro comes with 8GB RAM and 128GB ROM. The OPPO R17 is priced at SAR 1,799 while the R17 Pro will be available at SAR 2,599. In 2017, OPPO was ranked as the number 4 smartphone brand globally, according to IDC. And today, OPPO's business has covered 31 countries and regions, and has 6 research centers worldwide, providing excellent smartphone photography experience to more and more young people around the world. In 2015, OPPO entered the Egyptian market. In 2016, OPPO set up its Middle East & Africa Sales Center in Cairo. The markets OPPO has entered in Middle East and Africa include: Egypt, Algeria, Morocco, the UAE, Qatar, Oman and sub-Saharan Kenya. And OPPO MEA has launched in two new markets-- Tunisia and Nigeria. Also, OPPO MEA has prepared for entering the smartphone market of Saudi for over 6 months since June 2018. OPPO set up its factory in Algeria in 2017, which made OPPO the first Chinese brand setting up factory in North Africa. Now, the factory goes into production. Based on the insights of local consumers in each country, OPPO MEA has started the progress of localization. And the localization includes all the perspectives towards each market - product localization, to further meet the core needs of users; marketing localization, to better communicate with local young customers; and team localization, to know our local consumers further and provide better service to the consumers. According to GFK, the average price of OPPO products is the highest among all the Android phones and its sales amount ranked third in Egypt. Before selling suspension caused by policies, OPPO ranks top 3 in Algeria. To better serve our local customers, OPPO continues its branding with the release of F7 in July 2018. In the UAE and other gulf markets, OPPO uses its flagship model - Find X's release to adjust its positioning and cover more mid-to-high-end markets. In this way, products that can truly show out OPPO's strength will bring to customers. OPPO has finished several market researches in terms of Saudi in the early second half in 2018. After that, with the help of OPPO MEA, OPPO has set up a founder team with professional members to launch both brand and the latest products in Saudi. Moreover, to meet core needs of users in Saudi, OPPO KSA has built a localized team. Hence, OPPO KSA will provide not only outstanding products, but also professional service to the consumers in KSA. To meet different requirements of the market, the team of OPPO KSA is also multi-cultural - with the combination of different cultures, OPPO KSA will further understand all the users. With the launch in January 2019 in Riyadh, OPPO KSA will try the best to satisfy every consumer in KSA with the hand of OPPO MEA.